Think different and escape the rat race. Ask the Readers: How and when do you start withdrawing your retirement savings? 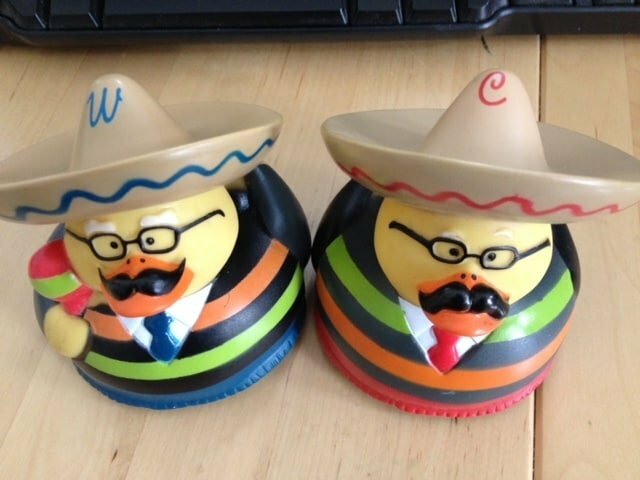 Warren and Charlie, in duck form. Hi again. Mrs. 1500 here with today’s question and the two winners of this year’s Warren Buffett and Charlie Munger ducks! A great big thank you to Mrs. PoP from Planting Our Pennies who is our guest judge this year. We had a lot of great responses from you when we asked ‘Who is your Warren Buffett?’ We wanted to know who it was, what they taught you and how it changed your life. So I turn it over to Mrs. PoP to announce the winners. My top pick goes to Even Steven. There’s so much wisdom in that short list of 3 things that are all so inter-related, from money, to relationships, and knowing that relaxation has a place in life. The minimum number of legs you need for a stool to stand is three, and I think this is one of those sets of three that when one gets out of whack, there’s no way you can continue to sit comfortably on your stool. So it just stresses the importance of balancing, money, relationships, and relaxation in life. My 2nd pick goes to reader Spiffi, for having totally awesome parents that not only had their own financial lives in order, but gave their time to help others figure their own finances out, which I think is very Buffett-like. Buffett and Munger don’t have to run the Q&A session or have big events at the annual meetings, they do it because they like sharing their thoughts and helping others understand. If only we could have all had parents life Spiffi’s! Thanks, Mrs. PoP for your judging services. Spiffi and Even Steven, check your inbox. And now to this week’s question, which comes from reader James. A few weeks ago, I asked you what you want to know. Are there any questions related to saving money/financial independence that you wanted answered? I think I have a pretty good idea of how to save now. Even though I’m 25 and won’t be making withdrawals for awhile, I’d like to get more information on the best ways to withdraw the money you need. How do you optimize taxes when withdrawing? Is there an optimal time of the year to make withdrawals? Which accounts should you withdraw from first? In my initial response, I suggested he mosey on over to The Mad FIentist, because he has quite interesting and unusual ideas about finances. But I would like to know what YOU, the reader, has to say about this. How and when do you start withdrawing your retirement savings? Join the 10s who have signed up already! Subscribing will improve your life in incredible ways*. *Only if your life is pretty bad to begin with. Thank you!! Please check your email to confirm your subscription. I have no idea how to answer this, but it’s nice on a Monday morning to dream about that day…. Dreaming is half the fun! It’s hard to look 60 years into the future to determine the best way to take the money out because we don’t know what the tax laws will look like at that time. Hopefully, you are putting money into Roth investments (IRA, 401(k)) because that money is never taxed again. That means you can put the money in and not have to worry about the taxes later. If all of your investments are going into traditional retirement investments (traditional IRA, traditional 401(k) or SIMPLE IRA), you will have to pay taxes on those when you pull the money out. There really is no right or wrong time of year to take the money out. You can have a set amount taken out each month or once a year. The taxes will not change. I think it is better to take the money out as you need it so you don’t take out too much. I would rather only take out as much as I need and not have to pay the extra taxes or just keep it in my investments so it can continue to grow. Two rules you should know about: You can’t take money out of a traditional IRA or 401(k) until 59 1/2 or you will be penalized. There are some special rules at 55, but they involve taking monthly payments for the rest of your life. Also with a traditional IRA, you must take minimum required distributions at 70 1/2. Essentially, you must start taking out money at 70 1/2. There is no similar withdrawal requirement for Roth IRA’s. Thanks for all of the advice! True, but I’ll also be in a much lower tax bracket. However, I do like your advice about the Roth 401k, especially since I believe taxes will go up. My employer just took ours away though. Jerks! As we see people retiring, we are actually finding that most people do not see their tax bills decrease significantly. Once you retire, your house should be paid off and your kids are grown and gone so the amount of write offs that you will have decreases. We also see increased medical costs, which are not fully deductible but add to the amount of funds retirees are withdrawing. I’m not seeing many of my clients going down in tax bracket upon retirement which is why the Roth is such a great option. I just got the email saying I won, I had to come check out the site to verify it was true. These are going straight to my desk at work, as a reminder to invest smart, be frugal, and achieve Financial Independence. Thank you Mrs. Pop and 1500 days for this prestigous award! When it comes to taxes and withdrawals, I defer to a tax professional, I have not come to this point in my FI journey, for me this would be like worrying about what Hawaiian Vacation I should take when I celebrate my 100th birthday, I can probably hold off on that for now and worry more about the the journey and saving and investing money. We’ll get them out this week. Enjoy! Since I am a dividend growth investor (DGI), I will be able to retire once my dividends cover my expenses and a little bit extra. Also, being DGI, I draw from the account from which the dividends originated. No need to worry about whether it is a taxable or retirement account. Dividends intrigue me, but I tend to lean more towards growth. At least for now. I do own Apple and Costco though which both pay dividends. I haven’t given that much thought to it really – I’m still quite a ways off from withdrawing! I hope others who are nearer or have started withdrawing chime in so I can learn more. My tentative plan is to withdraw “cash” first – dividends, etc. *then* principal. I plan on keeping 2-3 years of “cash” equivalents on hand for living expenses so that I can ride the ups and downs of the market a bit more stably. I would probably consider a monthly withdrawal to replace the “cash”, but I’m not there yet (kind of the reverse of dollar cost averaging). I’ve had the same thoughts as you. I’ve like to get a large pile of cash built up that will hopefully last years. If the markets take a huge hit, I’d pull from the cash pile instead of the investment pile. If markets were overheated (like now perhaps: http://www.multpl.com/), I’d pull from the investment pile. I am planning on using my investment money at 65. My small pension will kick in then too. I will live on my rental income and side hustle money from 56 to 65. By then, I hope my investments are at least double of what they are today. Maybe, after 11 years (from today), they will be. I am hoping to save a bit between now and then too. At 70, start collecting Social security to the tune of ~3200 a month, plus pension, plus rentals, plus investments, plus VA Disability. Of course, I might just start spending it sooner too. Nice, you’ve got it figured out. I’d be interested in knowing how many of your rentals you’ll hold on to. We’re still a ways off of this, so consultations with a tax guy and financial planner will probably be in the mix before then. But right now the game plan would be to start 72t withdrawals within a year or two of departing the work force, and live off those + rental income + withdrawals from taxable accounts until 55 (leaving the Roth to grow untouched in the meantime), at which point, we can start drawing down from Roth and taking bigger withdrawals from the traditional IRA than the 72t prescribes. Sounds like you have it figured out, more than me at least. I’d love to leave all my investments alone for as long as possible. Since rentals don’t make sense by us, I’m thinking of upping my money in peer lending. 200K in peer lending would spit out about 20K/year without touching the principal. Thanks so much for posting my question Mrs. 1500!!! All of these answers are incredibly helpful. While no one knows what the future holds in terms of tax laws I’m certain all of us here will be better off after thinking through the best ways to deal with the current tax laws. Thanks again and keep up the great work! Great content and great reader comments is a dynamite combination. Since James is just 25 I would suggest to spend most of his time finding ways to earn more, save more and invest more. There’s a long ways to go before he’ll be withdrawing from those accounts and the government loves to change the rules every now and then. If he wants an answer though, then once you figure out however much you need to support whatever lifestyle you’re after then I would say withdraw from tax-deferred accounts (Traditional IRA/401k) up to the 15% tax bracket to minimize taxes and any further income that you need then take that from tax free accounts (Roth IRA/401k). But it also depends on what your goals are as far as leaving money to charities, universities, or heirs and what the mix of your tax-deferred vs tax-free portfolios are. Thanks JC! I’m pretty happy with my savings rate (65%) and my investments in Vanguard Index Funds. I’m very much a planner, so I enjoy thinking ahead. Your advice is really helpful! My goal was to build a debt-free* portfolio of $1,000,000 by February of 2017; 1500 days from the birth of this blog (January 1, 2013). And hey look, I’ve since retired! *I still have about $100,000 in mortgage debt. My solution was to accumulate enough money to cover this or $1,100,000. Investing is risky business. The information contained on this site is for informational purposes only. As with all matters financial, proceed with caution. Do your research and seek professional advice. Subscribe to get great good pretty ok content by email. Thanks so much! Check your email to confirm your subscription.